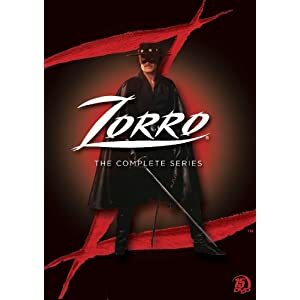 Set in Spanish California, this often-refilmed story chronicles the adventures of Don Diego de la Vega, a young nobleman who lives a double live as El Zorro (‘the Fox’), protector of the people of the Pueblo de Los Angeles during the early 1800s. Hiding behind the mannerisms of a bookish fop, Diego keeps his second identity hidden from everyone but his servant, Felipe. Zorro’s greatest enemy is always the Alcalde, who personifies the distant Spanish government in Los Angeles. Injustice in old California inspires Diego to become El Zorro. He battles numerous villains as well as the tyranny of two alcaldes, and is halfheartedly pursued by the funny and lovable Sergeant Mendoza (James Victor), who obviously admires his superiors’ nemesis. The fight scenes and the fencing are fun and fascinating to watch! Enchanting and fiery Victoria Escalante, the local tavern owner. is in love with Zorro, and regards handsome but bland Diego as a kind friend. Diego’s angst and desire for Victoria render Zorro – despite his super swordplay and heroic qualities – very human. Love for the beautiful Victoria is the fuel which feeds Zorro’s passionate fire. Que lastima! Diego sees her every day and can’t tell her who he really is. Figuring out how to solve this troublesome triangle is Zorro’s most difficult dilemma. Some of the episodes are on the darker side, but overall the tone is sort of like an Errol Flynn movie stretched over four seasons. And while it sounds like the premise would be limited, the writers actually did an excellent job keeping things fresh with varied plots — we’ve got pirate attacks, Japanese fishermen, jeweled swords, democratic elections, strange diseases, hypnosis and stolen gold, plus countless other stories. The DVD comes with a ton of behind-the-scenes material, stills and an old Fairbanks silent film. There’s a ton of trailers and you get a look at the original Family Channel pilot. The A/V Quality is still weak, as it seems like no one bothered to remaster the source material. The transfer is very weak, as the audio is so thin that a lot of material gets dropped during action sequences. In the end, I’d recommend a rental.